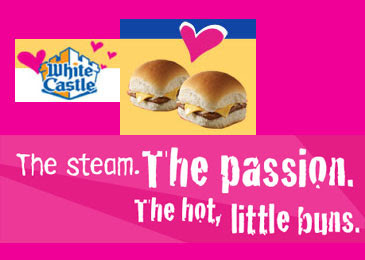 Here’s wishin’ y’all a steamy Valentine’s Day! hehehe thanks for the giggle! Hah! Day-um woman. Ya gots dat ack cent down to a science! 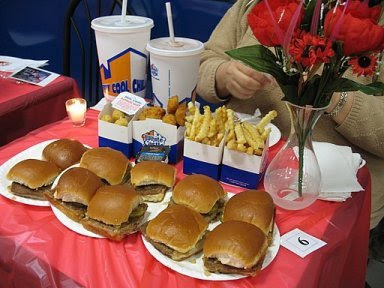 I <3 White Castle with a passion. My husband was going to call up and make reservations for this so he could take me. I wish now that I had let him do it. That would have been hilarious. The plastic table "cloth" is great. Mhmmm, those burgers look goood! Best Valentine's post ever!!! You should get a special award for your authentic writing. nice. And it was so great meeting you on Valentines day - and thanks again for the choclate! HA! 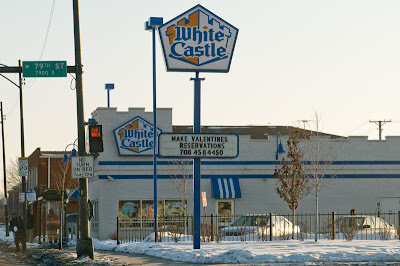 I've never actually seen a White Castle until now. Thanks for getting me up to speed. This is too funny! And now I am hungry!